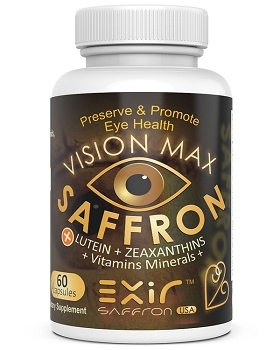 Lutein out of the three carotenoids found in the nature, is the pigment that gives Saffron its characteristic distinctive yellow, orange and some reddish colors as well as several aromas in the plant that directly absorbs damaging blue and near-ultraviolet light, in order to protect the macula of the retina, the part of the eye with the Sharpest Vision. Lutein is also one of the dominant pigments found in the macular region of the retina in the eye, where together with zeazanthin it forms the macular pigment. Traditionally in the macula, lutein is characterized by its blue light filtering and antioxidant properties. Studies have shown major causes for cataract formation are free radicals (damaging molecules) which mediate the formation ofcataract. Among the natural antioxidants and carotenoids lutein are well known for their anti-cataract properties. As in vision, Macular pigment (MP) is the collective name for carotenoids, Lutein, zeaxanthin whichare widely distributed in tissues and are the principal carotenoids in the eye lens and macular region of the retina. They are only available through dietary/supplement intake. MP is a blue light filter which is placed in the retina to reduce the amount of blue light reaching the photoreceptors; the higher the MP optical density the greater the amount of blue light filtering, a high-level of MP could reduce the risk of AMD. Epidemiologic studies shows that Lutein catenoid may help reduce the risk of certain types of cancer, particularly those of the breast and lung. Emerging studies suggest as well a potential contribution of lutein to the prevention of heart problems, stroke, and age-related macular degeneration and its protective role in the eye. AMD is a problem of the central retina that generally affects those over 55. Causes include environmental factors (nutrition, UV light exposure), risk factors (aging, hypertension, and smoking) and genetic predispositions. Emerging evidence points to Lutein also playing a role in visual performance, it is all about how well we see fine details, if we can distinguish between different objects (contrast) and recover sight after a flash of bright light. They form a filter (macula pigment) over the part of the retina responsible for detailed vision. This filter blocks out blue light and haze from strong light, which in turn increases the eyes’ tolerance for bright lights.